Hope For The World in Jesus. : Where are the Calves? I grew up in Kiambu county of Kenya right inside a small village called escarpment, I was one among many members of grandpas extended family. In the years of my childhood I lived together with my parents, siblings, grand parents and many other relatives. To date I deeply miss the village life especially the love and the warmth of the community life that existed and still exists to date between one with each other both in the family setting and with the neighbors. I owe much of who I am to the upbringing I got back then and to the many events and activities of my childhood. These happenings left an indelible mark on my life to date and hence I always remember and treasure them. Of specific mention to this post is my days as a young shepherd together with my so adorable grandpa. I will use this experience to try and address an issue of big concern today which is parenting and the care for the young people by the community. I remember so well how as a home or family we watched and waited with great expectations when a cow was a bout to give birth. The expectation was even more if it happened to be grandpa's cow mainly because him being the head of the extended family all that was his was also everyone else's in the family. I recall so clearly the time when three of his cows gave birth to very nice and strong calves all in the same month of July. The good news was that we had plenty of the very nutritious traditional yogurt (githana- as we called it in my kikuyu language) and hence our stomachs were guaranteed to be full for a good couple of weeks and equally there was a lot of milk in the family for all the houses to use and also excess to also to sell to neighbors and make some earnings. The sad news was that there was more work since the cows needed more feeding and that we had each a new and special responsibility to ensure the calves were well fed, well cared for and that they had to be suckled with care to their fullness at least three times a day. Along this period I observed keenly that my grandpa was very keen on the well-being of the calves as compared to the mother cows and I kept wondering why. For me with my limited knowledge then I thought the mother cows were more important now that they were the ones we would milk and get to make the precious cup of milky tea (I thought I should mention this for A CUP of TEA has a special meaning here in England especially in the long winter). This issue bothered me for a couple of weeks and in line with the African saying (paraphrasing) that what an old man can see while seated a boy cannot see even while on the top of a tree I could hardly grasp the wisdom behind why grandpa was more concerned with the calves than their mothers. I therefore, burning with a deep desire to know started asking a list of people about why the calves mattered more, I asked my uncle to start with and his response was simply that it was always the way grandpa did it. I wasn't satisfied and so one afternoon as we sat with grandparents in their kitchen some few minutes after grandpa had just handed us so much milk to feed the calves on I realized that that was the golden moment for me to have a glance at grandpa's wealth of wisdom. "Grandpa can I ask you a question please!" I asked with a very calculated naivety, "Oh yes! what do you want to know grandson." he responded so bravely. I knew the moment of great wisdom had been granted to me for indeed every time grandpa spoke or did something I always learnt a lifetime worth lesson and so I asked softly and in great expectation for a thick and solid piece of wisdom, "I have noted that you are always more keen on the calves as compared to the mother cows and you seem to really treasure the calves, why is that the case?". He looked at me wish such a surprised yet a 'proud of you' look on the face; he knew I was already peeping at his deep wealth of wisdom where only few if any were allowed. He knew I had been observing something precious in his acts and all I needed then was an explanation. I got to know this because every time he was about to share his wisdom and respond to such a deep question like this; he would always send a smiling glance to his sweetheart; my grandma, and then face the questioner immediately and only a sharp kid realized that such a glance had been sent. At such times grandma would start miming some song as a way to prepare the path for the answer in waiting and so my heart was already beginning to pound harder as I watched grandpa lips prepare to utter yet some more wisdom. This time he spread his hand towards me as I lifted mine slowly and humbly towards his and as the hands met he looked straight into my eyes and said; "Muriu wa muru wakwa!, (my grandson) Ruru rutari njau rititheremaga - translated in English to directly mean - a herd without calves never lives on or a herd without calves has no future." At this moment I had noticed that both grandpa and grandma were staring at me smiling happily as I tried to digest the words grandpa had just said, while the deep wisdom was getting clearer to me I could feel its heavy wight dawning on my mind and heart like the morning dawns after a previously very dark night and when the significance of the saying dawned to me fully I smiled back and they both unanimously said, "That is the reason calves are always to be treasured." They went ahead to give me some bit of explanations on the same though I was already swimming in the truth of understanding the saying in relation to the story and the entire life around me then as well as the life in that days future which is part of today. From that time a new wisdom had been made known to me, a wisdom that can never be taken away from me and a wisdom that matches so well with the reality of life's daily occurrences, that determines the future of any society as well as the future of the creation at large. I knew my grandpa had, still has, sons and daughters with whom he was and still is well pleased of, he however as I always keenly note has a more keen concern for every new born and the further a kid is in his generation line the more his concern grows for them, I mean he cares so well for his great grandchildren than he does for grandchildren or his own children. He also had very productive cows and he looked after them so well though he always took more care to the calves. During the days of childhood with grandpa I also realized that it was not only that he was so keen into wanting to see the herd make it into another generation but that he so well knew how vulnerable a young calf or a young child would be to the dangers surrounding each and so he invested and trained us to invent faithfully our care and time to such so as to not only have a future generation but to also have it fruitful and successful. What significance does this long story has to the society today and also to the young and vulnerable kids of this generation? I'm a young person though compared to the young people I have been called to serve by the Lord with him and in him here in Bury, Manchester I may be considered old. To them I might appear so old or even a non member of their so called young people context. From my old lessons and also out of experience I believe that any time invested to and among the young kids of any culture or society either by just giving them company, by accepting them, mentoring them, loving them, caring for them and relating to them without suspicion does not only assure us of our existence as a society in the future ahead but that it also gives the young ones protection, provision, motivation, courage, friendship and guidance through the many dangers we the older ones know about or have already been through in our past. The society has to look at them with love eyes and to accept them fully as part of it rather than strangers or those who are hoping to join the society in future, times they have so much energy just like the calves would always have but I remember grandpa would never allow us or himself to let them off his hands especially in the night or in the times dangers clearly surrounded them. We had to hold onto them for only in our hands or at our sight were they safe. In their jumpy life they did not understand the dangers surrounding them but that did not lower the pain in the consequences of their wrong move onto them when they landed into the danger. Kingdoms come and kingdoms go, heroes are born and heroes die but this one thing remains that a society that gives so much credit to it's great and successful history without focusing carefully, deliberately and cautiously into its future cuts its own future life tree slowly but surely towards death. I will pause at that to allow the reader to digest the long story and to see how it ties together with the society today but I will not fail to tell you briefly about one night of the many tough nights of my child age I will never forget. I was mean't to move the calves from their calf pen to grandma's kitchen where they would always spend the nights. The calves had grown a little bit bigger and they needed more care and wisdom in handling them and even more than one pair of hands to move them from one place to another. Knowing this I called on grandma to help me now that grandpa was still having a rest in bed. Grandma told me off and said I was big enough to do it on my own just as many parents would normally say when they were busy or unwilling to help a younger person. I hesitantly went on towards the calf pen and at that time it was getting darker and equally were my doubts growing bigger on whether or not I would manage to move the calves all by myself. 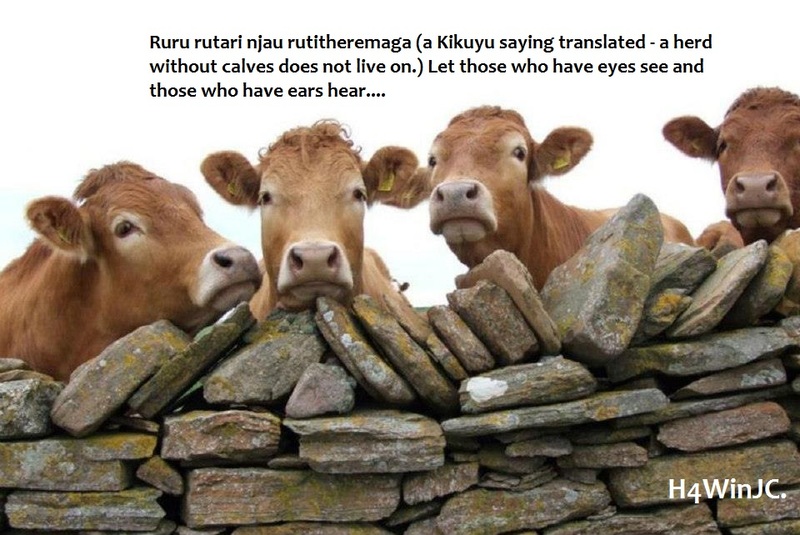 At this time the saying that I had learnt from grandpa just a few weeks earlier was speaking to my mind and heart so clearly and loudly which had made me so nervous... "Ruru rutati njau rititheremaga - translated in English to directly mean - a herd without calves never lives on or a herd without calves has no future." At this time I had gotten at the calf pen and the now very strong calves were all waiting at the calf pen's gate to be taken away from the cold and the darkness.